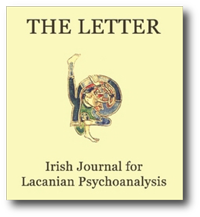 Once again THE LETTER is delighted to be in a position to present our readers with the proceedings of the Annual Congress of the Association for Psychoanalysis and Psychotherapy in Ireland. That organisation’s event in November 2001 took Lacan’s seminar of 1968-69 – D’un Autre a Vautre – From an Other to the other – as its theme. It is appropriate then that this issue begins with Cormac Gallagher’s overview of that year in Lacan’s teaching. And it deserves to be mentioned here, for the benefit of those unfamiliar with this aspect of the annual congress, (for all involved in the event hardly need be reminded) that the overview is especially welcomed over the years coming as it does from someone whose commentary on and translation of Lacan’s work has been central to its progress here in Ireland. The works that follow on this one each represent some aspect of the year’s work of the various authors who contributed to the day in November. Rob Weatherill presents us with a discussion of psychoanalysis in relation to the work of Levinas. Patricia McCarthy looks at the centrality of the o-object to the clinic. Lieven Jonckheere’s brief comment is included here – although it did not emerge during the congress – since it is a neat little note on the plus-de-jouir which finds its way into each of the other articles here and which will be of use to those reading the 1968-69 seminar as well as the one following on it – Venvers de la psychanalyse. Tom De Belie’s work tackles the subject of toxicomania in some depth, underlining the importance of the Lacanian approach in determining what particular structure the addiction serves either to mask or to support. Included in this is an attempt at the construction of a differential diagnostic tool for the use of those who may be charged with assessing candidates for treatment. As is the case with this latter article, Hugh Arthurs’ paper is an expanded version of his brief contribution to the ‘research section’ of the congress and gives us a more than comprehensive overview of the notion of the drive in psychoanalysis. Aisling Campbell gave us her account of what she came away with from her attendance at the somewhat bizarre arranged marriage attempted between Neuroscience and Psychoanalysis and which took place at the Anna Freud Centre in London last year. The final paper in this issue is perhaps the strangest. And this has less to do with the content than it has to do with the manner and means by which it makes its way to you! Claude Landeman’s contribution on the day was delivered in French; a spoken commentary on Lacan’s treatment in the 1968-69 seminar of Le Pari de Pascal – Pascal’s Wager. The text we offer you today as a representation of that is an edited version of the text compiled from the notes, taken down by diligent note-takers in the audience, of Claude’s talk and of Cormac Gallagher’s phrase-by-phrase translation of it. So what is conveyed to you today is a combined effort, the work of many hands. And if for all that we have been left with something resembling the unwieldy, many-tentacled creature referred to in Cormac Gallagher’s ‘overview’ – one is at a loss to know whether one should apologise or congratulate oneself!